Cody Hedlund on Teles One Time. Ted Petit Photography. On Monday, Cody Hedlund, Lipan, Tex., scored 220 points riding Teles One Time LTE $62,309, by One Time Royalty, to lead 80 qualifiers to Tuesday’s NCHA Kit Kat Sugar Super Stakes Non-Pro Classic second go-round. Bill Cowan, Ardmore, Okla., earned 219.5 points, the second-highest score of the go-round, on Catty Minx LTE $39,352, by Catty Hawk, while Jody McGlothlin, aboard Somethingtobelievein LTE $214,348, by Hydrive Cat, scored 219 points, the third-highest score among Non-Pro qualifiers, tying the highest score among Non-Pro Limited riders. Cody Hedlund, the NCHA Non-Pro Hall of Fame earner of $932,861, won the 2011 NCHA Super Stakes on Teles One Time’s half-sister, Teles Bout This Cat LTE $230, 047, by WR This Cats Smart, and was reserve champion of the 2014 NCHA Super Stakes Non-Pro on the Metallic Cat son Meteles Cat LTE $433,565, a three-quarter-brother to Teles One Time. Teles Lies LTE $93,206, dam of the three money earners, was trained and shown by Cody’s father, Rock Hedlund. Last year, Cody Hedlund and Teles One Time placed sixth in the NCHA Super Stakes Non-Pro, and this year, the pair won the Ike Hamilton Futurity Classic Non-Pro championship. Hedlund also won the 2019 Ike Hamilton Derby aboard Wood Ya Teles LTE $26,924, a Woody Be Tuff daughter out of Teles Bout This Cat. Bill Cowan, the NCHA Non-Pro Hall of Fame earner of $29,455, won the 2008 NCHA Futurity Non-Pro Limited championship riding Catty Minx’s sire Catty Hawk LTE $239,044, who was named Leading Freshman AQHA Sire of NCHA money earners in 2014. In 2017, Cowan won the Breeders Invitational Non-Pro Classic aboard Billies Catty LTE $225,578, the blue roan Catty Hawk daughter who also carried Cowan as reserve champion of the 2018 NCHA Non-Pro World Championship standings. Catty Minx LTE $39,352 made her debut with Michelle Cowan, Bill’s wife, as a finalist in the 2017 NCHA Non-Pro Futurity, and has since won money under Bill, Michelle, and trainer James Payne. 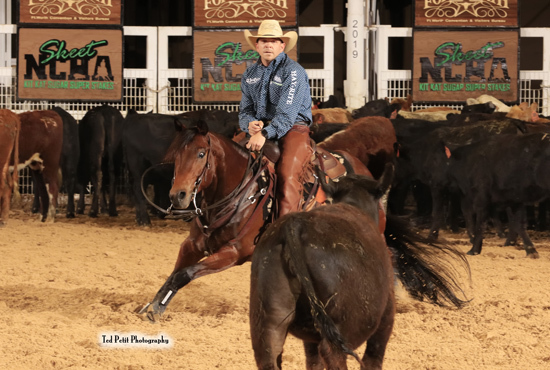 Jody McGlothlin, the NCHA earner of $222,070, won the 2016 NCHA Futurity Non-Pro Limited riding Somethingtobelievein, and in 2017 won three more Non-Pro Limited championships, the Cotton Stakes, the Southern Futurity, and the Brazos Bash, under the sorrel mare. And along the way, Jody’s husband Brett was making news with Somethingtobelievein in Open limited age events. Last year, the pair placed third in the NCHA Super Stakes Classic Open, and won the Augusta Futurity Open Classic and the Cotton Stakes Open Classic. Earlier this year, Jody and Somethingtobelievein won the Augusta Futurity Non-Pro Classic. This Thursday, Jody McGlothlin and Somethingtobelievein will compete in the NCHA Super Stakes Classic Non-Pro Limited Finals along with 16 other riders, including Gentry Gonsalves, Millsap, Tex., and Bear Davis, also of Millsap, who tied McGlothlin with 219 points, the high score among Non-Pro Limited go-round competitors. Gentry Gonsalves rides 6-year-old Georgia Bootlegger LTE $28,976, the Dual Smart Rey gelding who carried her to place third in the 2018 NCHA Super Stakes Classic Non-Pro Limited and as reserve champion of the 2018 NCHA Classic Challenge Non-Pro Limited. Earlier this year, Gonsalves, an NCHA Senior Youth Rider and NCHA earner of $31,417, showed Georgia Bootlegger to claim reserve in the Arbuckle Mountain Non-Pro Limited and placed fifth in the Arbuckle Mountain Non-Pro Finals. Bear Davis, the NCHA earner of $172,126, rides the 5-year-old Metallic Cat gelding My Beach My Wave LTE $37,683, who he showed as a semi-finalist in the 2018 NCHA Super Stakes Non-Pro. Davis won the 2016 NCHA Super Stakes Amateur Unlimited, as well as the Breeders Invitational Amateur, with Red Solo Catt LTE $156,919.